Calbag Metals is well-positioned to meet the challenge of tighter scrap import restrictions as China prepares to expand its ban of scrap material. The People’s Republic of China is the largest consumer of scrap copper products, purchasing more than half of the world’s scrap copper supply in 2015, but is poised to prohibit certain scrap metals, including insulated copper wire (ICW), radiators, shredded metals, and more. President Xi Jinping recently ordered a review of scrap metal and recyclable imports to reform China’s “solid waste import management plan.” This is a direct result of an ever-increasing pollution problem China is facing along with a desire to no longer be viewed, internationally, as the world’s dumping ground. China has already started restricting and revoking import scrap plastics as part of their “National Sword 2017” custom clearance program, but these additional restrictions indicate China is moving quickly and aggressively to curb other scrap import. 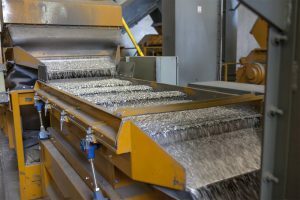 As the unofficial hub of the world’s recycling and manufacturing system, any restrictions on scrap copper, aluminum, and other products would have a dramatic effect on recyclers everywhere. US scrap exporters will be forced to look to other outlets for their scrap ICWs and radiators, with many of those alternatives offering lower pricing. Calbag Metals is prepared for these changes and restrictions. We process Insulated Copper Wire (ICW), Insulated Aluminum Wire (IAW), ACSR, Light Contaminated Extruded Al, and more, in-house, at our processing facility in Portland, OR. We own and operate the largest, full-service, multi-material processing systems in the Northwest and create a product which is a direct substitute for primary, mined metal.